Woke briefly just after 4 am to the sound of the wind tearing over the house. Later in the morning we discovered “tearing” appropriate. No tress down but pieces torn from the grape vines that cover the pergola, a few unsecured bits around the verandah scattered and in the tomato bed the odd damaged tomato seedling. Nothing major else where. The worst situation is strong wind after rain when the ground is sodden and the natives have no grip in the ground. When this happened last time we lost over 20 trees. One of the best jobs we completed when we first arrived was the planting of a double row of Casuarina trees on the westerly aspect.These Casuarina Glauca are well over 10 metres tall. The spacing filters and breaks up the wind and protects the orchard and the house. 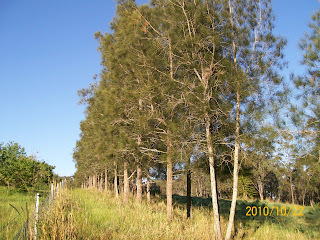 Casuarina are excellent for this task as they are drought tolerant and equally happy with wet feet. They seed prolifically and send up shoots thickening the wind break. They can also be eaten as fodder by cattle. They wind also caused a power outage. When we first acquired the property, power was very unreliable with outages almost every month. As a result we purchased a petrol driven generator which has paid for itself many times. It is always fully fuelled with extension cords nearby. About 20 minutes is required to connect the water supply and the kitchen. 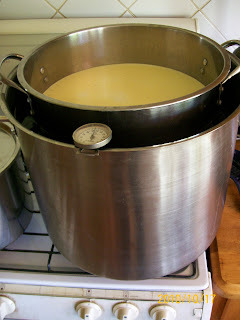 Every few weeks we make a large quantity of yogurt from unpasteurised milk. By placing a 15 litre stainless steel pot inside a 25 litre stainless pot partly filled with water we create a bain-marie like contraption. This means the temperature can be kept reasonably constant more easily. Thermometer is placed in the water and as the temperature drops to the minimum it is easy to fire up the stove top and bring back to the maximum. The temperature depends on which culture is used. We purchase our culture from Cheeselinks. They publish a small book which covers cheese and yoghurt making as well as supply all the components of cheese and yoghurt making. It’s best to make this on a day where you are not far away so that the temperature can be monitored. Our culture takes about 6-8 hours but we keep it going all day and let it sit overnight. 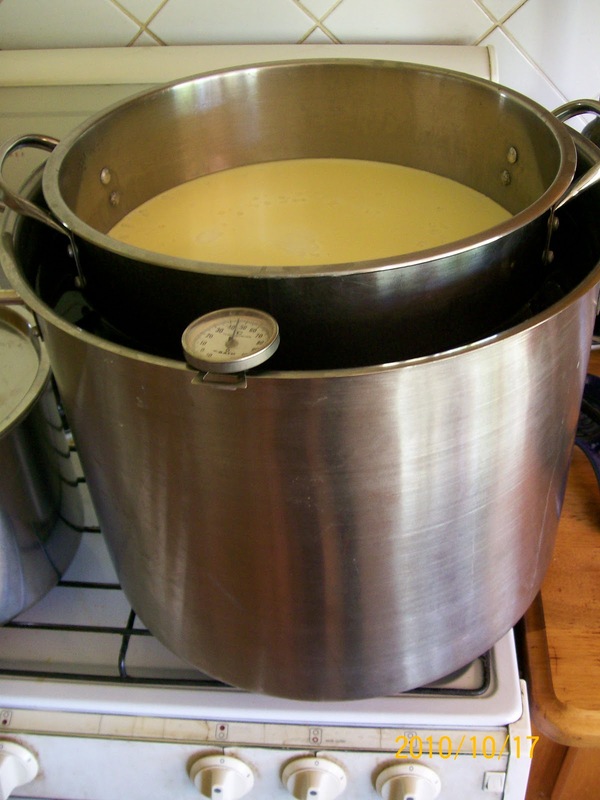 The next morning it is chilled in the refrigerator (or put in the freezer for a shorter time) and then to get a thicker consistency it is drained in a large sieve lined with cheese cloth (or in our case a piece of nylon curtain) sitting on a 9 litre plastic bucket. The longer it drains the thicker it becomes. If Labna is required leave it there all day turning it every now and then until it is thick enough. The book says that you can add skim milk powder to the milk before you start in order to save the draining process. Skim milk powder is full of free radicals and like any heavily processed food best avoided. Lastly the drained liquid is used to soak grain overnight and fed to the chooks. They really like the soaked grains. Alternatively add it to the compost and let the worms have a feast. Salted roasted peanuts are delicious. Unfortunately the shop bought variety are roasted in vegetable oil. In itself not all that bad but vegetable oil is high in Omega 6 and our Western diets tend to be too high in Omega 6. One way to enjoy this snack at a significantly lower cost and in a healthier form is to roast your own. Buy raw peanuts, preferably Australian grown, as they are produced under more stringent regulations than the imported nuts. Many wholesalers sell them very cheaply in kilogram packs. Put them in a baking dish no more than 2-3 deep and bake in an oven at 180-200 degrees Celsius for 20-30 minutes until brown enough for your liking. The thicker the layer of nuts the longer it takes. They may need a stir occasionally as the outsides edge tends to cook first. While they are cooking mix some salt (no more than a tablespoon unless you like it quite salty, otherwise a teaspoon is enough) with a couple of table spoons of water. This will service a kilogram of nuts. When the peanuts are cooked to your liking pour the mixture of salt and water over them while they are still hot and mix thoroughly. The water will evaporate and the salt adhere to the nuts. We’ve found that we can survive with only one car these days. With both of us working part time, one locally, a single car and a bicycle work very well. On the odd occasion when a push bike isn’t an alternative (which is very rare) it just means getting up a little earlier to share a ride. Riding 15-20 kilometres 2-3 times a week doesn’t hurt the waist line or the aerobic activity. The big benefit is the annual cost saving. It is not just the fuel, registration, insurance and maintenance it is also the waisted capital investment which only depreciates. Even with only one vehicle we still don’t make special trips. If shopping needs doing it is done on a work day either after work or both travel together with one shopping while the other works. Again, applying a permaculture principle about making everything have more than one benefit. And that doesn’t mean just going to two shops. No quick trip down to the corner shop for a newspaper. Here are two obscure tips on saving fuel. They may not have any scientific backing but they were found accidently. One tip is to buy fuel in the morning on the cheapest day of the week. The reason is that the fuel is cooler and takes up less volume, consequently you get more for your dollar. Another tip is if you have a big fuel tank and are going on a long trip keep the tank only partly filled so that you are not using fuel to carry the extra kilograms with you. When you are dependent on one car there are some things that become important. Membership of a roadside service group is good insurance. Regular servicing of the car pays for itself over the long term. We drop ours off every 10,000km with a very good mechanic. This ensures any problems are spotted early. Our purchased 2nd hand car is 9 years old and approaching 300,000 kilometres with no breakdowns or major problems. Our disaster recovery plan is firstly a rental i.e. if we need a second vehicle or the current one is out of action. It is cheaper to rent a small vehicle for a week or more than maintain a second vehicle. Secondly when we bought this car we started saving for its replacement. That money is kept in a term deposit with interest accruing ready to buy a good 2nd hand replacement should this one become unreliable. Some other cost saving tips are buying the vehicle from the fleet car auctions which (whenever we have purchased) have always been cheaper. Selecting the vehicle based on our planned usage ie we drive a 6 cylinder because of the need to tow a large trailer and the predominately highway driving of 80 km/hr or more. Our vehicle had the lowest fuel consumption for these needs. Attend a few auctions first and record selling prices on different makes of similar featured cars. Not surprisingly some makes are consistently cheaper because of a perceived, not necessarily real, quality issue. Little things affect the final price. Features such as an ugly colour, front bench seat and column gear change on a sedan lower the bidding. Plainer cars are cheaper. There can be a $5000-$8000 difference between makes of the same vintage and optioned vehicles. Not so long ago we gave some fertilised Guinea Fowl eggs to a friend who lives a few kilometres away. Three of the eggs hatched producing two boys and a girl. The resident male Guinea Fowl on that property had soon enticed the lone girl. He treated the two boys badly with repeated attacks. The boys took it stoically and just cowered under the beatings. Our friend asked if there was any opportunity to rehouse them. As we had a much larger flock we felt they could be accommodated. When they first arrived we placed them in a large disused aviary for the first couple of weeks to enable them to acclimatise. After the breaking in period we left the door open but it was almost another two weeks before these timid boys would tentatively come out. Each day they went a little further. They always stayed together. Eventually they roosted on a steel cross piece near the aviary and returned each day for food and water. Gradually, as they grew, they became braver and would circle over to the house where a dish of food was kept for the resident yard poultry immediately running away if anyone or anything approached. They were devoted to each other, almost as if twins. They ate together and would have running games afterwards like two children. We named them Benjamin and Lewis after the characters in Bruce Chatwin’s novel On the Black Hill They never approached or joined the other Guinea Fowl. At some point Lewis started to chat to one of the single girls on the other side of the fence. He stayed in the yard and she in the orchard. Then gradually he and Benjamin would jump the fence into the orchard but always return not long afterward. Every night the brothers slept on their steel perch side by side. Still totally devoted to each other. Lewis maintained some contact with the female but Benjamin only ever knew Lewis’s company. For some unknown reason the other day Lewis went where he had never gone before, all the way to the chicken pen. He panicked once inside and couldn’t work out how to escape. We were not far away and decided to let him calm down and work his way out. Unknown to us one of our dogs, a working cattle dog, was attracted by the fluttering and noise. In the ensuing fuss Lewis was bitten but not just a minor loss of feathers, a tooth punctured his lung. He was clearly seriously hurt and we were forced to put him down. Benjamin witnessed all this. He was completely distressed. Eventually he went to their perching spot and just slumped below the perch with his head hanging and spirit completely broken. This morning before light we could see a single outline on the perch. Benjamin alone for the first time in his life. The saddest sight in the world.